یکی از واقعیت‌های دنیای امروز حضور اسلام در نقاط گوناگون جهان است؛ موضوعی که نه‌تنها مسلمانان بلکه پیروان سایر ادیان نیز روزبه‌روز بیشتر نسبت به آن آگاهی پیدا می‌کنند. بر این اساس اقلیت مسلمان در آمریکا نیز مانند سایر نقاط جهان شکل گرفته و در تعامل و یا حتی تقابل با اکثریت غالب قرار می‌گیرد. در میان نظریه‌پردازان ارتباطاتِ میان‌فرهنگی، مارک اورب و ریجینا اسپلر به بررسی چنین تعامل یا تقابلی در نظریه «هم‌فرهنگی» می‌پردازند. لذا می‌توان با رویکردی پدیدار‌‌شناسانه و مبتنی‌بر نظریه «گروه خاموش» و نظریه «نقطه نظر» رفتار کنشگران مسلمان را به‌عنوان گروه هم‌فرهنگ در برابر گروه سلطه که از لحاظ سلسله‌مراتب هویتی در موقعیت بالاتری قرار دارند، مورد بررسی قرار داد. در چنین وضعیتی مسلمانان آمریکایی، استراتژی‌های خاصی برای ایجاد ارتباط با یکدیگر و نیز با ساختار غالب ایجاد می‌کنند که این امر براساس تجربیات و مصاحبه‌های عمیق به‌عمل‌آمده از آنان، گاه به‌شکل انزوا و قطع رابطه با گروه سلطه، گاه به‌شکل تعامل پایاپای با آنان و گاه به‌صورت انطباق کامل با ساختار غالب معنا می‌یابد. Allen, B. (2000) “Learning the Ropes”: A Black Feminist Standpoint Analysis, in P.
Feminist Perspectives, Thousand Oaks, CA: Sage. Erince, S., Taser, I. & Algar, H. (1991) “Islam Ansiklopedeisi”, in turkiye Vakfi, Vol. Populism and Cultural Damage), in Šahrvand-e Emroz, Vol.3 (51):45.
International Communication Association, Acapulco, Mexico. Journal of Communication, Vol.13 (4/5):-. Translated by Piroz Izadi, in Faslnâme-h Rasâne-h, Vol. 17 (3): 49-98. Gudykunst, W. (2005) Theorizing About Intercultural Communication, London: Sage. Vosoqi, Tehran: Sâzmân-e Madârek-e Farhangi-ye Enqelâb-e Islami. Hobson, A. and P. Willis, Culture, Media, Language, London: Macmillan. Women and Political Power), Translated by Možgân Dastori, Tehran: Našr-e Ejtemâ. Husserl, E. (1964) The Idea of Phenomenology, the Hague: Martinus Nijhoff. Kramarae, C. (1981) Women and Men Speaking, Rowley, MA: Newbury House. Translated by Xânbegi, Tehran: Entešârât-e Beynolmelali-ye Alhodâ. of Contemporary World), Keyhân, Vol. - (18607): 7. American Muslims Community), in Majale-h Maood, Vol. - (78):-. Esposit, New York: Oxford University Press. L .Esposit , New York: Oxford University Press. and Communication, Thousand Oaks, CA: Sage. Management Communication Quarterly, Vol. 12 (2): 230-279.
meeting of the National Communication Association: Chicago, November. Culture), Translated by Ziyâii, Tehran: Edâre-h Kol-e Pažohešhâ-ye Sedâ va Simâ. the National Communication Association: Chicago, November. of Conflict and Consultation), Tehran: Samt. Arâbi, Tehran: Daftar-e Pažohešhâ-ye Farhangi. Communication and Culture 1), Translated by Mahdi Bâbâbi Ahari, Tehran: Samt. Knowledge, Boston: Northeastern University Press. Unpublished doctoral dissertation: Arizona State University. the National Communication Association: Miami, November. Hossein Pâyande-h, Tehran: Našr-e Âgâh. Tabliqât-e Islami-ye Hoze-h Elmi-ye Qom. World, (277-284), Oxford: Oxford University Press. استوری، ج. (1386) مطالعات فرهنگی در‌باره فرهنگ عامه، ترجمه حسین پاینده، تهران: نشر آگه. اسمیت، آ. 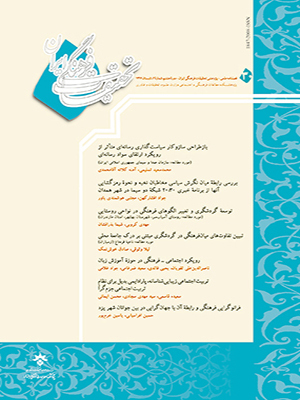 (1379) ارتباطات و فرهنگ (1)، ترجمه: مهدی بابایی اهری، تهران: سازمان مطالعه و تدوین کتب علوم انسانی (سمت). _____ (1382) ارتباطات و فرهنگ (2)، ترجمه: اکرم هادی زاده مقدم، طاهره فیضی، و مهدی بابائی اهری، ، تهران: سازمان مطالعه و تدوین کتب علوم انسانی (سمت). پارکه، ب. و دیگران (1383) قدرت فرهنگ، ترجمه ضیائی و دیگران، تهران: انتشارات اداره کل پژوهش‌های صدا وسیمای جمهوری اسلامی ایران. خداقلی‌پور، م. و وزیری، ف. (1379) اسلام و مسلمانان در آمریکا، قم: مرکز انتشارات دفتر تبلیغات اسلامی حوزه علمیه قم. رابینز، استیفن پی (1380) مبانی رفتار سازمانی، ترجمه علی پارساییان و سید محمد اعرابی، تهران: دفتر پژوهش‌های فرهنگی. رضائیان، ع. (1382) مدیریت تعارض و مذاکره، تهران: سمت. سان، ت. (1381) فضل الرحمن (مجموعه مقالات اسلام در امریکا)، ترجمه خانبگی، تهران: انتشارات بین‌المللی الهدی. _________ (1383) پیوند تفاوت‌ها؛ راهنمای ارتباط کارآمد بین گروهی، ترجمه علی کریمی (مله) و مسعود هاشمی، تهران: انتشارات تمدن اسلامی. محمد، ا. (1381) «مالکم ایکس» (مجموعه مقالات اسلام در آمریکا)، ترجمه خانبگی، تهران: انتشارات بین‌المللی الهدی. وتن، د. و کمرون، ک. (1382) مدیریت تعارض، ترجمه سید مهدی الوانی و حسن دانایی فرد، تهران: مؤسسه تحقیقات و آموزش مدیریت. هینگ، ر. (1384) و هینگ سیمون، زنان و قدرت سیاسی، ترجمه مژگان دستوری، تهران: نشر اجتماع. یازبک حداد، ا. و لوئیس، آ. (1371) گسترش ارزش‌های اسلامی در ایالات متحده آمریکا، ترجمه افضل وثوقی، تهران: سازمان مدارک فرهنگی انقلاب اسلامی. Burrell, G., & Morgan, G. (1979) Sociological Paradigms and Organizational Analysis, London: Heinemann. Findley, P. (2001) Silent No More: Confronting America's False Images of Islam, Beltsville, MD: Amana Publications. First, A., & Lev-Aladgem, S. (2000) “An Israeli Community Theater as a Site of Feminine Self-image Reconstruction”, Paper presented at the annual meeting of the International Communication Association, Acapulco, Mexico. Fox, S., Giles, H., Orbe, M., & Bourhis, R. (2000) “Interability Communication: Theoretical Perspectives”, Handbook of Communication and People with Disabilities: Research and Application, Mahwah, NJ: Lawrence Erlbaum. Hall, S. (1980) “Encoding and Decoding in the Television Discourse”, Culture, Media, Language, London: Macmillan. Lurner, L. & West, R. (2003) Introducing Communication Theorys, Boston: McGraw-Hill College. Mathewson, D. (1995) The Oxford Encyclopedia of the Modern Islam World (226-300), Oxford: Oxford University Press. Nasr , V. (1995) The Oxford Encyclopedia of the Modern Islam World, Edited by John L .Esposit , New York : Oxford University Press. Nyang, S. (1995) The Oxford Encyclopedia of the Modern Islam World, Edited by John L .Esposit, New York: Oxford University Press. Orbe, M. (1998a) Constructing Co-cultural Theory, An Explication of Culture, Power and Communication, Thousand Oaks, CA: Sage. _____ (1999) “Negotiating Multiple Identities in and around Organizational Margins: A Case Study in Co-cultural Theory”, Paper presented at the annual meeting of the National Communication Association: Chicago, November. Phillips Gotr, P. “African American Communication, Organizations, and Assimilation: A Co-cultural Perspective”, Paper presented at the annual meeting of the National Communication Association: Chicago, November. Smith, D. (1987) The Everyday World as Problematic: A Eminist Sociology of Knowledge, Boston: Northeastern University Press. Spellers, R. (2000) Cornrows in Corporate America: Black Female Hair / Body Politics and Socialization Experiences in Dominant Culture Workplace Organizations, Unpublished doctoral dissertation: Arizona State University. Spellers, R., Sanders, F. & Orbe, M. (2003) “The Business of Black Hair / Body Politics: A Co-cultural Analysis of Black Professional Women's Aesthetic Representations in a Contested Site of Workplace Culture”, Paper presented at the annual meeting of the National Communication Association: Miami, November. Yazbeck Haddad, Y. & Smith, J. (1995) The Oxford Encyclopedia of the Modern Islam World, (277-284), Oxford: Oxford University Press.